Our Market Research capabilities support each practice area with state-of-the-art methodologies and innovative research designs. Our strong background in the Information Technology and Communications industries, combined with deep expertise in a wide range of quantitative and qualitative methods, serves to help our clients further understand their current and potential markets, customers, competitors and partners. BOSTON, April 18, 2014 (GLOBE NEWSWIRE) -- A recent survey by LogMeIn, Inc. (LOGM) and Edge Strategies reveals that IT professionals significantly underestimate the scope of the bring-your-own-app (BYOA) trend in their workplace. Designed to explore the usage and adoption of employee-introduced cloud applications in the US, Canada, the UK, Ireland, Australia and New Zealand, the study delves into the types and numbers of applications entering the workplace, as well as IT's response to managing and controlling this influx. As indicated in the study, while approximately 70% of companies surveyed reported active use of employee-introduced apps in the workplace, IT professionals surveyed estimated the number of these apps to be 2.8 apps per organization. However, subsequent data collected from similar-sized organizations via app discovery technology found that the average number of BYO apps to be closer to 21 per company -- a staggering 7 times more. Conducted by Edge Strategies on behalf LogMeIn, the survey explores the impact of BYOA, a trend at the intersection of two of the biggest IT industry transformation drivers: the pervasive rise of cloud offerings and the consumerization of IT. Survey questions covered popular apps and categories like cloud file sync and share apps (e.g. Dropbox, Cubby, Google Drive), collaboration apps (e.g. Skype, join.me, Trello), productivity apps (Evernote, Google Apps for Business/Google Docs), as well as social apps and remote access apps. Survey respondents included IT professionals, outsourced IT service providers and non-IT business professionals sourced from organizations ranging from SMBs to mid-sized companies to large enterprises. 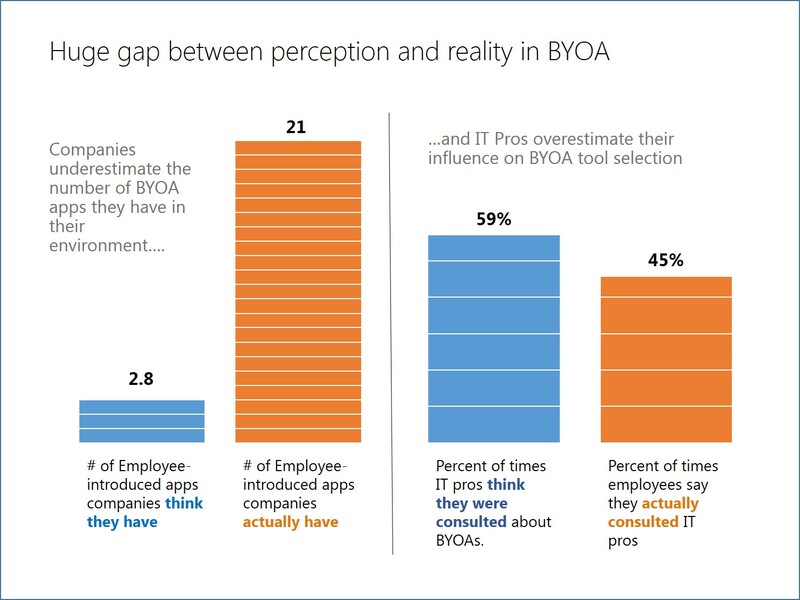 IT professionals, in particular, were also asked about their own BYOA policies, current approaches to management of these apps, as well as their role in evaluating, influencing, and securing such apps. -- Employees lead, IT follows: Apps originally introduced by employees are often later adopted and/or endorsed by IT for broader use within the organization. -- Free and unmanaged versions are the norm, even after IT endorsement: Even after IT pros endorse employee-introduced apps, only a very small percentage of those apps become centrally managed. "The rapid rise of cloud offerings -- along with the consumerization of IT -- is forcing major changes to the way IT operates, and calling into question IT's overall relevance in today's employee empowered workplace. The critical security and management requirements remain IT's primary mandate, and yet IT is increasingly outside of the loop when it comes to app selection and worse, the way data is stored and shared across these apps," said W. Sean Ford, CMO of LogMeIn. "We believe that the role of IT needs to be fundamentally redefined if IT professionals want to regain their strategic voice, and this means reinventing the way they approach the management of apps, devices and data in the BYO era." This survey is part of a series of major research studies recently conducted by LogMeIn that focus on the state of IT management in today's world of independent, "BYO" consumers. The series will focus on three key areas: managing applications, managing devices and managing data. For this study, we explored usage and adoption of employee-introduced applications within companies worldwide and how this has led to a loss of control for IT managers. We partnered with Edge Strategies to survey IT and non-IT professionals across the world in various-sized organizations, including both LogMeIn customers, as well as an independent panel. Respondents included 1,390 IT and Non-IT professionals in the US, Canada, the UK, Ireland, Australia and New Zealand. LogMeIn (LOGM) transforms the way people work and live through secure connections to the computers, devices, data, and people that make up their digital world. The company's cloud services free millions of people to work from anywhere, empower IT professionals to securely embrace the modern cloud-centric workplace, give companies new ways to reach and support today's connected customer, and help businesses bring the next generation of connected products to market. 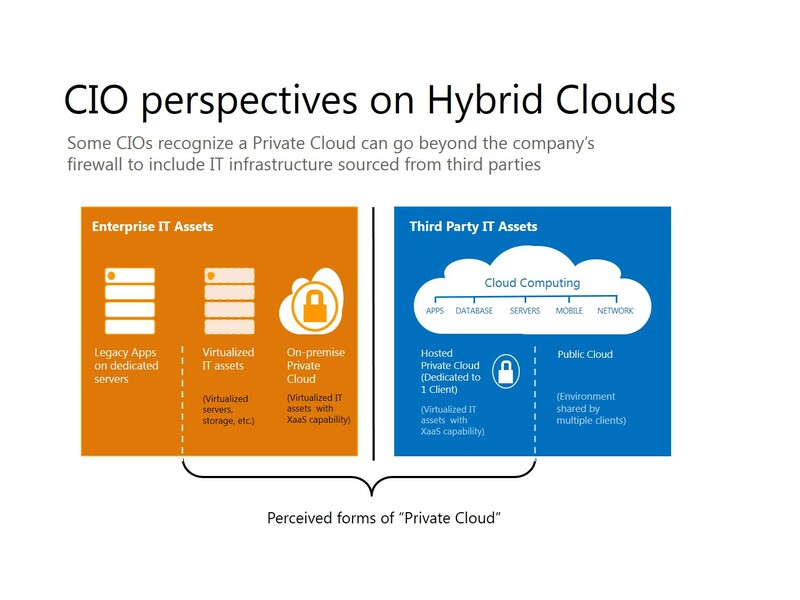 What Cloud products and services are currently being provided by Midsized? What key trends are driving changes in their business models? 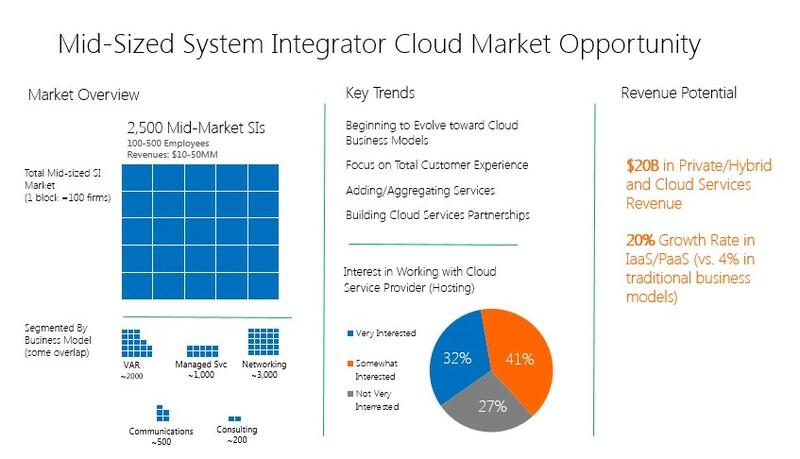 What are the key factors determining their selection of Cloud IaaS/PaaS/SaaS partners? How do they prefer to engage? Which SIs provide the highest potential return? What specific steps can the client take to build effective channel relationships with these firms? Edge Strategies conducted Qualitative and Quantitative research with a broad range of mid-sized Systems Integrators. Edge Strategies segmented the competitive landscape into several distinct but overlapping business models, each with key differences impacting potential Cloud service provider relationships. What products and services did they traditionally offer? How is this likely to change with the Cloud? What is the typical size and scope of their engagements? How many Clouds providers will they work with? What are their critical selection criteria? How do they prefer to engage? What balance of flexibility and control do they expect from a Cloud provider? What are their support/SLA expectations? How price sensitive are they? These and other factors were mapped against the Client’s current and planned product and services offerings to create a set of specific recommendations for identifying partners and building effective and profitable channel relationships. A global supplier of IT technologies engaged Edge Strrategies to resolve the Cloud Computing perspectives and plans of CIO/IT Executives responsible for the data centers of major US and European firms. These and other findings were the foundation for targeted strategic recommendation to help the client improve customer perception of their capabilities and increase market share.